The Governor of Bermuda is appointed by Her Majesty the Queen, on the advice of the British Prime Minister. He is responsible for upholding the Bermuda Constitution and for other duties as assigned by the Queen or her Ministers. The primary responsibilities in Bermuda of the Governor are external affairs, defence, internal security, and the police. The Governor is the Commander-in-Chief of the Royal Bermuda Regiment. British Ministers expect Governors to observe international obligations and to protect key values, such as the independence of the judiciary, the political impartiality of the public service, and integrity in the administration of justice. The Governor works closely with the elected Government of Bermuda. View list of previous Governors of Bermuda. Mr. John Rankin CMG has been the Governor of Bermuda since December 2016. John Rankin CMG was previously British High Commissioner to Sri Lanka and the Maldives. He has also served as Director, Americas in the Foreign and Commonwealth Office, responsible for a network of over 30 British Embassies, High Commissions and other posts in North, Central and South America and the Caribbean. He joined the Foreign and Commonwealth Office in 1988 as a Legal Adviser and served in that capacity at the UK Mission to the UN and to the UK Mission to the Conference on Disarmament in Geneva. He has also served as Deputy Head of Mission at the British Embassy in Dublin, working on the Northern Ireland peace process, and was Her Majesty’s Consul General in Boston. John has a degree in Scots Law from the University of Glasgow and a Masters Degree in International Law from McGill University, Montreal. Prior to joining the FCO he qualified and practised as a solicitor in Scotland and was a lecturer in public law at the University of Aberdeen. He has three adult children. His hobbies include football, tennis and playing bad golf. The Deputy Governor is appointed by the Governor to act as Governor in his absences. Outside of those times, the Deputy Governor assists the Governor in his responsibilities. In particular, the Deputy Governor chairs or is a member of various committees charged with work under the broad responsibilities of the Governor. The Deputy Governor represents the Governor on the Emergency Measures Organization Executive Committee and works with the Bermuda Government to ensure that a wide range of disaster and counter-terrorism plans are regularly exercised and updated as necessary. 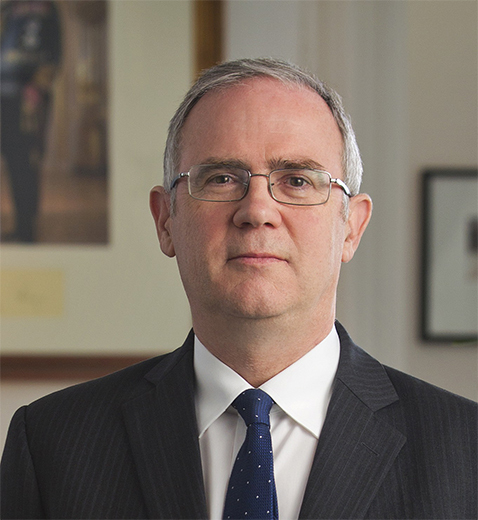 As a member of the Foreign and Commonwealth Office (FCO), the Deputy Governor is also responsible to the governor for ensuring that Bermuda meets the international obligations that the United Kingdom has assumed on its behalf, such as marine, aviation, environment, and human rights issues. Ms Alison Crocket was sworn in as Deputy Governor of Bermuda in July 2018. She joined the Foreign and Commonwealth Office in 2001 and has served in various roles most recently as the Head of Anti-Corruption in the FCO’s Economic Diplomacy Directorate. She worked on secondment from the FCO to UNAIDS in Geneva from 2011 – 2015 as a senior policy adviser for most vulnerable populations and was eight years in Vienna representing UK interests at the UN Office of Drugs and Crime. Before her diplomatic career Ms Crocket worked in a number of public health and social care roles for local government and voluntary organisations. She has a degree in Law and a Masters in International Law. Her partner Pete Westmore, accompanied her to Bermuda and her two grown up daughters and son in law, Lindsay, Kirsty and Angus will be frequent visitors. The family dogs, Laurel and Harvey are with them in Bermuda. The Governor of Bermuda lives in Government House, a 33-acre estate in Pembroke Parish. Government House employs 20 executive, secretarial, and domestic staff who work for the Governor and Deputy Governor.